Projections of climate-fuelled sea level rise show terrifying scenarios with major economic centers like New York and Miami losing much of their land to rising seas. But for some communities in the United States, losing land to climate change isn’t a future nightmare — it’s a present and daily struggle. According to new analysis from the Center for Progressive Reform, at least 17 communities across the United States are currently being forced to relocate due to climate change. And the majority of those 17 — like the residents of Isle de Jean Charles in Louisiana — are indigenous communities for whom relocation would mean leaving coastal areas replete with cultural and economic significance. But relocation could be made easier, according to the report, if federal and state governments work to create opportunities for impacted communities to purchase or obtain land in less vulnerable areas. 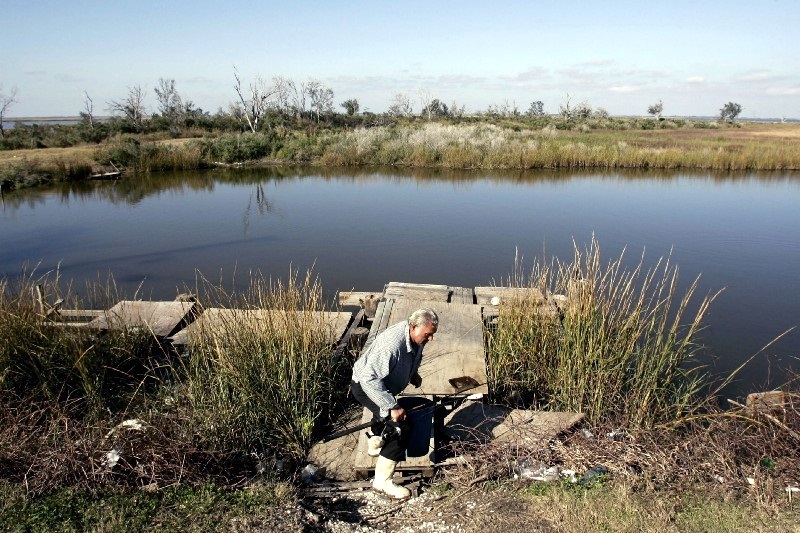 In places like Isle de Jean Charles, stronger storm surge and rising sea levels, coupled with industry activities like cutting channels through the low-lying land, have caused the island to erode at a dangerous rate. In 2016, the Department of Housing and Urban Development (HUD) awarded the community a $48 million grant — the first of its kind in the country — meant to help relocate some 60 residents to higher and more stable ground. Several federal agencies, including HUD and the Bureau of Indian Affairs, have the ability to help communities that need to relocate due to climate change, either through direct grants or subsidization. But, according to the Center for Progressive Reform’s new report, relying on federal grants to provide the necessary funds for relocating vulnerable communities presents serious problems for the impacted communities. The report also suggests that communities could try to generate their own revenue to purchase new land through some kind of industry, like selling timber on their existing land or extracting valuable minerals. That option also comes with caveats, however, because sometimes resource extraction merely exacerbates environmental degradation that, in turn, hastens erosion of the tribe’s land. A final way the report suggests vulnerable communities could acquire land is through litigation, referencing a 1976 lawsuit where the Mashantucket Pequot Tribe was awarded $900,000 to purchase reservation lands that had been sold to the state of Connecticut. Similarly, the report argues, indigenous communities could look to the courts to help regain land that could provide a suitable place for relocation in the face of climate change. But again, the authors warn that this strategy has its drawbacks. Public nuisance claims about climate change — where the plaintiff argues that climate change has caused an irreparable harm — have been notoriously difficult to argue in court, because courts have been hesitant to connect the climate crisis to the actions of a single defendant. Plus, since the Supreme Court ruled in 2007 that the EPA has authority under the Clean Air Act to regulate greenhouse gas emissions, courts have generally viewed any federal common law claims as preempted by the EPA’s authority to regulate carbon. In 2008, for example, the Alaskan village of Kivalina asked courts to find ExxonMobil liable for the estimated $400 million cost of relocation, which they argued was forced upon them due to climate change. In 2009, the Ninth Circuit found that the question at hand was displaced by the Clean Air Act, and dismissed the case. Because there are such complicated policy questions at hand with regards to relocating communities impacted by climate change, the Center for Progressive Reform’s analysis concludes by arguing that the federal government must redouble its efforts to help these communities. That conclusion, however, appears at odds with the current trajectory of U.S. climate policy. The Trump administration has shown interest in cutting funds to nearly ever climate-related program across the federal government, and is considering pulling out of the Paris climate agreement as early as next week. Meanwhile, climate models suggest that between 50 million and 200 million people will likely be displaced due to climate change by 2050.